Mission Communications SCADA Systems – Pre-Engineered for Lift Stations, Tanks, Instrumentation, Rain Gauges, Flow Monitoring | JCI Industries Inc.
Mission Communications – SCADA was the first to use the digital control channel of the cellular network for monitoring, control, databasing and automated alarm/status notification for fixed base assets in North America. MISSION combines national public wireless data networks, Internet technologies, databases, graphical user interfaces and computer telephony technologies into prepackaged SCADA systems. MISSION does not just manufacture hardware — we supply the rest of the tools that provide customers management information concerning their remote facilities and the people that maintain those facilities. The hardware simply gathers the information. MISSION is continually upgrading its centralized management information services, which are immediately available via the Internet to all its customers. 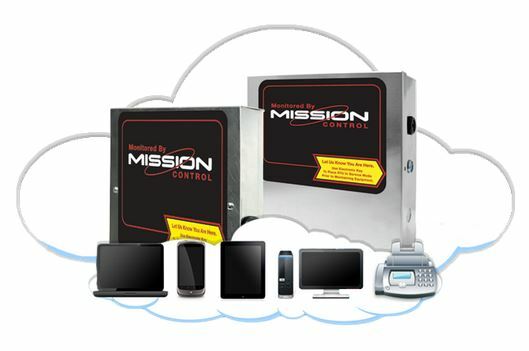 MISSION is committed to maintaining total customer satisfaction by providing the highest quality remote monitoring equipment and notification services, utilizing the most cost-effective wireless transport technology, and exceeding customers’ expectations. With today’s wireless technology, the only constant is change. MISSION‘s customers can always take advantage of the latest hardware and wireless network breakthroughs with our generous trade-in and upgrade policies. Let JCI’s factory trained technicians professionally install a Mission unit to any lift station, water tank, line pressure or any other monitoring need. Installation is unobtrusive and lets you take advantage of a full SCADA system that is so simple, that we’ll have you up and running in less than a day. Use it as a stand alone system, or as fill-in or backup for existing SCADA systems. Cities including Olathe, Gardner, Blue Springs, Springfield and many others have taken advantage of Mission SCADA systems. Take advantage of the free trial and the ability of a fully implemented systems at a fraction of the costs of traditional SCADA. In many cases, such as a lift station monitoring, enjoy the MISSION SCADA system for less than the price of many auto-dialers. 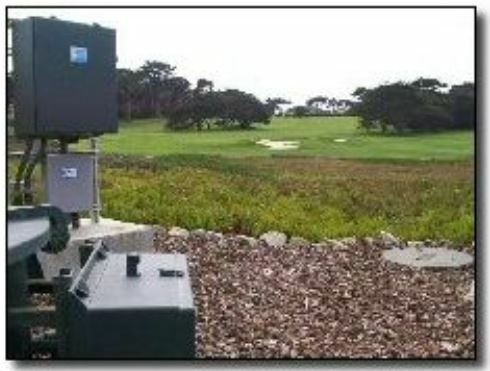 Follow the link to Mission’s website for the full case study of “Pebble Beach – Mission for backup of existing SCADA System”. With its reliability and affordability, other cities and utilities can make Mission their primary or only SCADA system. The MISSION system includes the use of all our web based SCADA software, software upgrades, and hosting and maintaining two customer web sites. All technical support, and all wireless data and long distance telephone charges and archiving of the customers’ historic device data is also included. In addition, the MISSION system can send all your data through an OPC interface into your SCADA software. Contact JCI or email askjci@jciind.com to discuss a free trial. You may wonder exactly what is included in the annual service fee purchased with a field RTU (Remote Terminal Unit, RTU). What are the actual ongoing costs of the Mission system? Are there any hidden fees? Do I have to buy cellular service to make the RTU work? What about excess messages – are there charges for excessive alarm notifications? Are there any software licenses I have to purchase? How many people can use the system? How long do you keep RTU data? What happens if my RTU is damaged? What about security? Mission RTU’s are available in two models. The M-110 provides comprehensive digital alarm point monitoring and hourly analog reports. The M-800 does everything the M-110 does, and adds real-time pump status, analogs, and automated control. Using traditional SCADA for the complex process control and large input/output needs that frequently occur in-plant makes sense. Bringing that level of complexity and cost into the simpler monitoring and control needs at lift stations does not. MISSION makes two systems so you can mix RTU’s and match them to your needs. Both RTU’s share a common electrical interface, come in the same enclosure choices, and have many of the same operational features. It is easy to evaluate this remarkable system as free 60 day evaluations are available; it’s a remarkable value as a complete system costs less than most dialers and a phone line. Graphs of Daily/Hourly Pump Runtimes and Starts – In addition to automatically collecting and posting runtimes and starts, MISSION’s software will chart and graph them too. The M-110 will collects up to three pump runtimes and starts while the M-800 will take up to eight. Both systems will also track and report simultaneous runtimes in duplex lift stations as well as automatically notify you if a pump exceeds an adjustable hourly starts threshold. Automated Pump Problem Analysis of Daily Runtimes – Save money by letting the MISSION system catch pump problems before they turn into expensive alarm conditions. 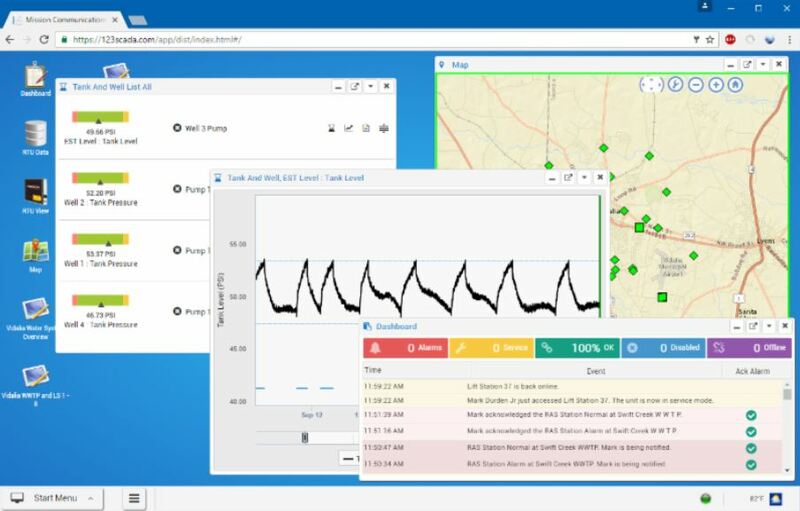 Save time by letting the MISSION software catch pumps that aren’t running in their normal variance parameters, and automatically alert plant management in a separate notification list. Estimated Flow Calculations – The M-110 estimates flow by multiplying runtime times the draw down confirmed GPM of each pump. While you can connect a flow meter directly to an M800 and have it report and graph realtime flow, it can also calculate and report the volumetric flow calculations of each pump cycle. RTU-to-RTU Automatic Control of Upstream Lift Stations – The real-time M-800 RTU will detect a high wet well level, send you an alarm and automatically call upstream lift stations with M-800s and shut down their pumps until the high level clears. Remote manual control of pumps or gates is also included. Integrated Site Activity Logs – From its inception, MISSION has used electronic keys as an integrated part of tracks who is checking in and out of field sites. This allows the operator to keep CMOM audit trails without resorting to soggy or illegible paper sheets kept at each station. The Latest End-To-End Security – The best levels of security encompass multiple overlapping systems that maximize security throughout the whole system; MISSION uses this approach and meets the standards for communications that AWWA and Homeland Security have set. Maintenance Free RTU’s, Wireless Links And…Everything – There is no maintenance for you to do on any MISSION RTU. If there is a RTU problem, you simply replace the board or radio at a guaranteed price that’s about 15% of a new unit; easy access to the RTU board and radio make changes a snap. If there a problem with a cell tower, the RTU will automatically connect to another one while the cellular carrier fixes it. MISSION maintains your web sites, databases, software…everything. Our use of advanced programming techniques produces a convenient and cohesive interface that works with a large monitor, desktop, tablet, and smartphone. This portal also offers a “classic view” that incorporates all the modern conveniences of the new 123SCADA site, but with the same menu organization as the site you have used before. There is no software to install or software licenses necessary with 123SCADA.com, so you can take full advantage of this completely new interface. There are no additional fees or charges to use our updated web portal. Our use of advanced programming techniques produces a convenient and cohesive interface that works with a large monitor, desktop, tablet, and smartphone. The portal also offers a “classic view” that incorporates all the modern conveniences of the new 123SCADA site, but with the same menu organization as the site you have used before. The engineers of Mission Communications have added the “Daily Volumetric Flow Summary Report.” More than just a flow report, it centralizes the vital statistics of a pump station. Like all other Mission reports, it was inspired by a customer’s request. Mission does not charge extra for adding this type of functionality to the system when it is likely to benefit other users. Our service is meant to grow with customers’ needs. The Daily Volumetric Flow Summary Report centralizes all monitored pump station activity. A primary function of this report is to present volumetric daily flow calculations without the need for analog or pulse flow meters. Volumetric flow is calculated by taking the surface area of the sump and the change in level during a pump cycle (on/off/on) to accurately estimate inflow. Mission customers report that the volumetric flow calculations are accurate to within 5% of analog and pulse flow meter readings. In addition to providing timestamped minimum, maximum, total, and average volumetric flow rates, the “Station Summary” section highlights runtime, rainfall, alarm, and connectivity statistics for the station. The “Pump Detail” section drills down to show the operation of each pump. One can quickly assess pump health by checking its starts, runtime, flow statistics, and variance at a glance. 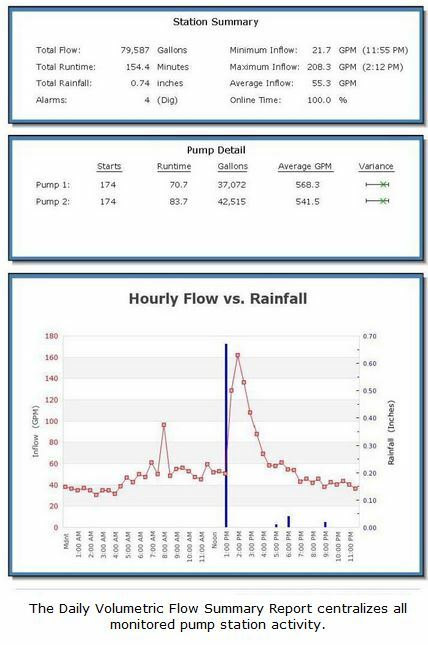 An important report feature meant to detect potential stormwater inflow at the station is the “Hourly Flow vs. Rainfall” graph. It does exactly what its title implies, graphically displaying the correlation between hourly flow and rainfall in an easy-to-read format. By default, rainfall data comes from your local NWS station, although inputs from local tipping bucket equipped RTUs can be used instead. Because real-time pump start data is needed to calculate volumetric flow, this report is only available for M-800 RTUs. For M-110 RTUs without analog or pulse flow meters, other reports are available which present flow calculations using the GPM method. This method derives flow by multiplying pump run time by GPM rating and is dependent upon calibrated or certified GPM ratings for increased accuracy. A M-110 RTU can be upgraded over the air to a M-800 RTU if the volumetric method is preferred.